This article is about the spirit. For the computer security firm, see Damballa (company). Damballah La Flambeau, by the Haitian artist Hector Hyppolite. Damballa also spelled Damballah (Haitian Creole: Danbala) is one of the most important of all the loa. Damballa is the Sky Father and the primordial creator of all life. He rules the mind, intellect, and cosmic equilibrium. White rum is sacred to him. 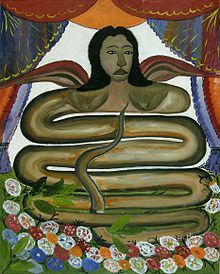 Damballa, as the serpent spirit and The Great Master, created the cosmos by using his 7,000 coils to form the stars and the planets in the heavens and to shape the hills and valleys on earth. By shedding the serpent skin, Damballa created all the waters on the earth. Damballa is syncretized with either Saint Patrick, Christ the Redeemer, Our Lady of Mercy, or Moses. Damballa's wife is Ayida-Weddo, and Erzulie Freda is his concubine. ^ Perrault, Alix. "Vodou and the Loas". The Vodou Element. Archived from the original on 2014-11-07. This page was last edited on 14 March 2019, at 11:42 (UTC).